And a great block it is Lstew! MJP - so fun when they all measure up, isn't it? All the blocks posted so far are lovely! 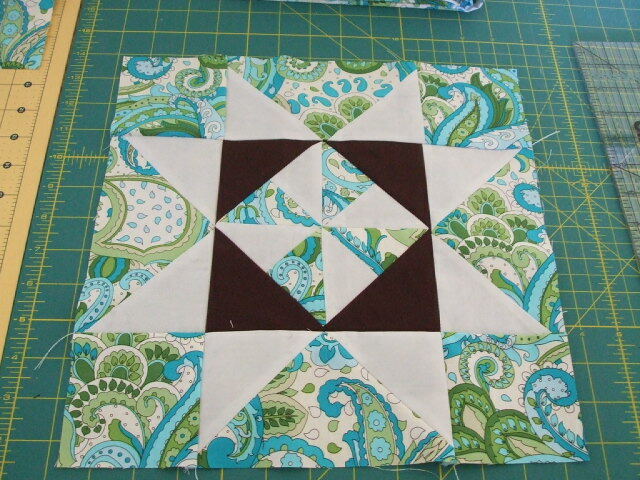 It's fun (as a new Booomer) to pay attention to other's fabric pairings, block choices, etc.. I'm enjoying all of your talents ladies. In the meantime, I'm playing around with EQ8 and going through the Beginner workbook chapters - learning a bunch and picking out some block patterns too! Nothing like the intricate blocks that the rest of you do but I made my first star block that has the 1/4 inches beyond the star points so the points won’t be cut off. And it’s 12 1/2” square! the picture isn’t quite accurate. All the points have the 1/4 inch. Oh, I love this star block! I have not done one like this (Hint, Hint). LSTew - you have mastered those flying geese - mine still come out wonky! Your fabric has so many possibilities can't wait to see what you want it matched with. The only place where housework comes before needlework is in the dictionary. 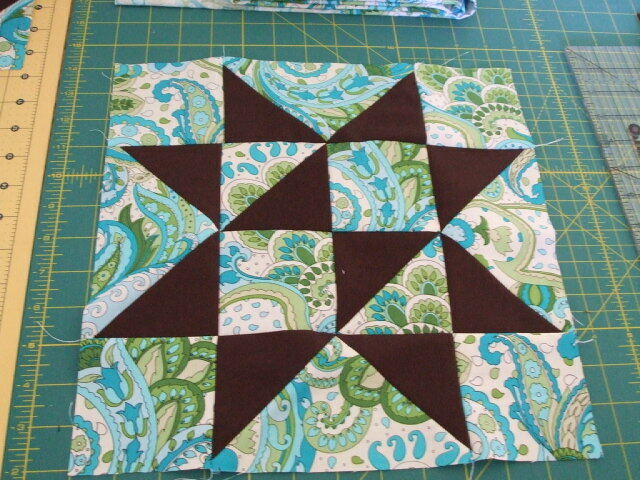 Beautiful star block MJP. It's been one of my favorites, so I get the hint, Libster. It's an interesting one to play with because the star points seem to change depending on what you do with the corner squares. It's just an illusion, but that's what I love about it! Congratulations on getting the right size and the points in the right place! Woo hoo! Not easy in the beginning. It's a great block. Love the table runner as well. Will add it to the gallery soon. Here’s a table runner from previous boom blocks. Pretty block, Lstew. Good job! Well I haven't been playing w/ my fabric and blocks, but I did get all 6 placemats finished (and the table runner). I hoping to get a lot of work done on the brown / cream quilt. I have been looking at block ideas saving a few pics getting some ideas. "Never cruel, nor cowardly, never give up, never give in." Let's take care of the Earth, it is the only planet that for sure has Chocolate. Sonic screwdrivers, fez, bow ties, and Stetsons are cool. All 26 packages are at the front door waiting for today’s pickup. By Wednesday, most of you will have your F8s. Yay! Big reminder for everyone, immediately after you open your packages, be sure to count your F8s. Everyone in Later will have 19. You need to confirm this so there’s no question later. Be careful to separate them from your own fabrics. This round I’m using a beautiful gift bag to hold mine. They are always in there except when I’m working with them. Once a block is made, they get put back in. Use whatever system works for you but do keep track of all of them. Thanks! And they’re off! You should be able to begin tracking them almost immediately. 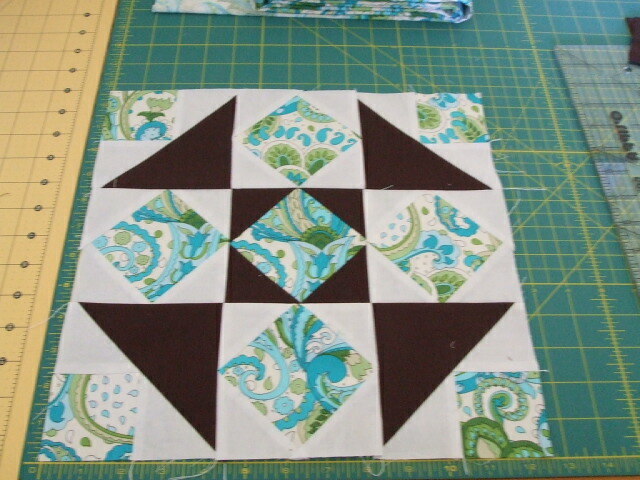 I've been making some extra blocks for my quilt so will show you what I've sewn so far. That brown might look like black on your monitor but it is a deep chocolate brown. The blocks should be here tomorrow but I will be at the doctors most of the day, MRI and PET scan scheduled...ugh!! Libster my husband added the tri-rec rulers to his amazon order so you will get one of those star blocks. More practice for me! Jaba, thanks for posting these. It helps me see the shade of brown you want. Beautiful blocks. Hope tomorrow goes well and that the results will help the docs figure out what’s going on. Will be thinking of you and sending positive vibes your way. Jaba - your blocks are lovely! It really is helpful to see all of these self-made blocks and even more helpful that they're arranged together in the gallery for us to use as a guide. I hope your scan and MRI bring you the best of results tomorrow, too! I've peeked on the USPS website to track my package.. hoping there's smooth sailing on I-85N This is like waiting for Santa Claus on Christmas Eve! 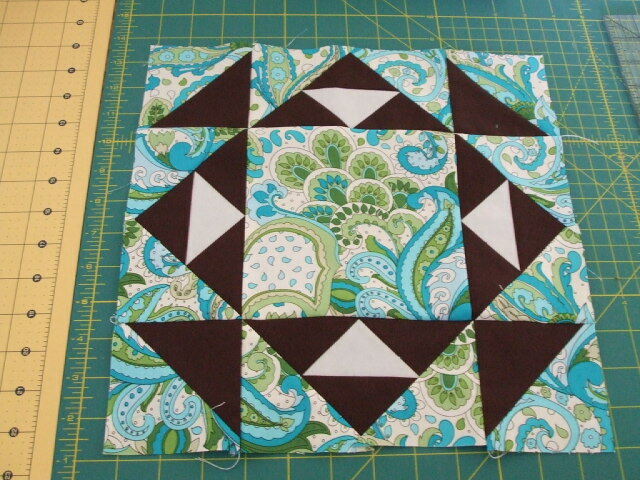 Jaba, all of your blocks are so pretty and that fabric is absolutely yummy! I think I've already got the perfect chocolate to go with it. Prayers and crossed fingers for the MRI and the Pet Scan. Jaba beautiful blocks and also hoping for good results on all your tests. Have a nasty health issue going on here also. Went to doc yesterday and came home with 4 prescriptions hoping they start to work quickly so I don’t lose my mind from all the aching, burning and itching. 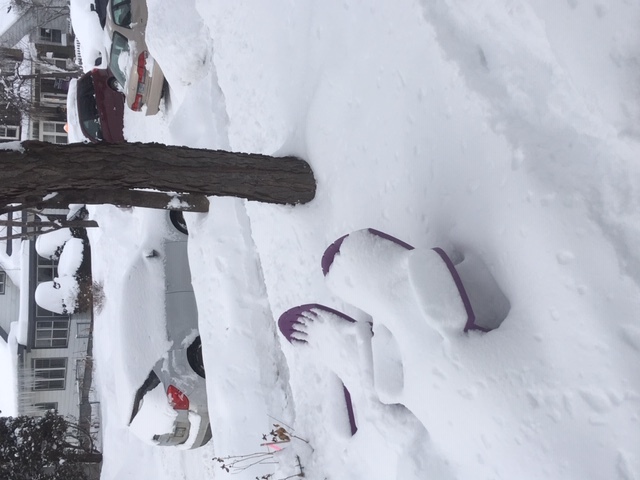 Six inches of snow fell Sunday and 4” more last night. Pretty to look at but a real mess for those who have to drive in it. Wow, Terri! That bites that you get back home and promptly get sick. May I recommend lots of hot coffee or.... and heaps of quilts to keep you warm. I think half the population here are sick with the flu. I had pneumonia for Christmas, I sure don't want the flu now! Our church is doing our semi-annual Chicken-N-Dumplings Supper next Saturday. I'm beginning to wonder if we're going to have enough well people to man it! Jaba, beautiful quilt blocks! You will be on my mind tomorrow while undergoing all of your tests. Praying for the best results on all of them (((Hugs))). Terri, hope you feel better soon. Sure don't miss the snow, I see back home in Wisconsin that the schools were closed once again today. Libster, chicken and dumplings sound wonderful, it's one of my favorite meals. I'd come if it weren't so far away! Chicken an dumplings sounds yummy. I made it once and right in front of us the dumplings dissolved. Never tried them again. The first thing I thought when I saw this pic was "who would sit still long enough to let the snow cover them like this?????" Then I thought "How many toes does he have??????" Then I laughed at myself as I saw they were chair backs!!!! lol lol lol This is 100% true, and I have had no wine today. I had a similar thought Kass... I thought somone built a relaxing snowman! I don't know whether to be ashamed or honored. The stray cat that Gary worked so hard to tame and who is now a committed pet cat heard me driving home today. She came out the front door and greeted me, walking over to the edge of the driveway and asking to be petted and carried in, like .................................................. ... a................................................. ..................... gulp .................................................. ...... dog! Jaba - enough - leave a few blocks for us to make!! - they look beautiful with that chocolate brown. Hmm - most things go with chocolate! Bubblesuits are not helping the illness and yuckys going about. Any suggestions? Maybe wear some kind of mask? I pray all are well when your F8s arrive - and please keep us updated on your test results.